Here at Corona Contracts, we specialise in protecting our clients from the damaging effects of the sun, which includes heat, glare and ultra-violet light. We provide specialist blinds and curtains designed, manufactured and fitted to specification. Our commercial blinds division allows us to take control of each step of the process, giving us complete control over delivery times and costs. Add to this the fact that we work closely with clients in order to provide bespoke products for their specific business or institution and it is clear why we have been the obvious choice in this industry for the last twenty years. Many studies have proven that the efficiency of a workforce increases when employees enjoy the environment they work in. A big part of this is creating the right kind of lighting, and being able to easily adjust the amount of sunlight in any room. Nobody wants to work with direct sunlight in their eyes, but at the same time, working exclusively in artificial light isn’t something you would choose either. Corona Contracts can work with you to supply and install exactly the right blinds for any given environment, including blinds that can be controlled remotely. 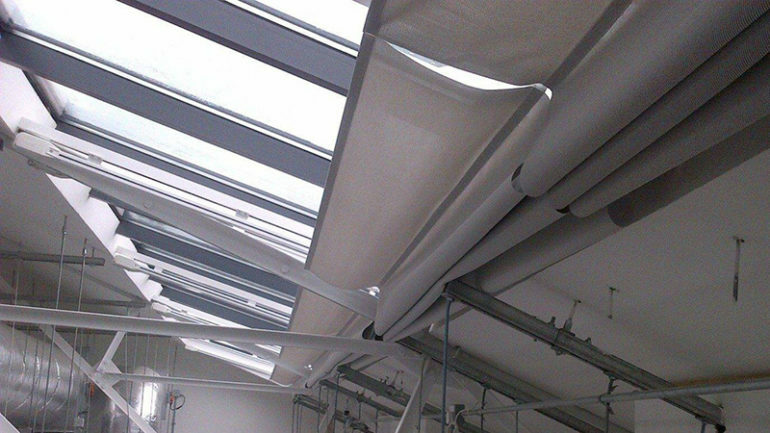 Our installations allow for complete and accurate control of light entering a workspace, so staff can enjoy the benefits of natural light whilst also avoiding distracting glare on computer screens, whiteboards and presentation areas. For situations where complete darkness is required, perhaps in an event space or a hotel, we also offer a range of blackout blinds which are fully compatible with our motorised systems. We specialise in manufacturing these to the exact specifications of our client so that they eliminate all light entering a space. Click here for more information on our blackout blinds. We use only the best quality components, such as Mottura products. Their softshade curtain tracks are an excellent choice for reducing glare and solar heat while still maintaining light in the office. Another option is Mottura’s blackout blinds which will eliminate outside light- excellent for rooms in which presentations are done on-screen or on an overhead projector. Again, these are customisable based on your specifications and can be specifically developed for every type of window, including sloping skylights. To discover more about our Mottura motorised systems, click here. Corona Contracts can help you maintain a pleasant and professional working environment. Our panel blind systems might suit your office or conference room. Again, we are able to create bespoke versions of these products and they have all the functionality to go along with their aesthetic attributes- they can be controlled with the “M2Net” system, a range of products and software developed by Mottura for Automation Control which can be operated from a PC, tablet or smartphone. Our motorised systems do not prohibit manual operation. We instal manual operation failsafes too, so if you find the power has failed in your building you won’t be left without control of your blinds. In the unlikely event of any other problems with your installation we are proud to offer industry-leading aftercare services. If you have any questions about our motorised blinds supply and installation services, please don’t hesitate to contact us on 01772 616426 today!